Whipples Penstemon is a member of the Snapdragon or figwort Family. It grows to 2 feet in height and has dark green, elliptical leaves which grow at the base of the plant to 4 inches in length. Leaves along the stem are lance-shaped and grow to 1 inch in length on opposite sides of the stem. 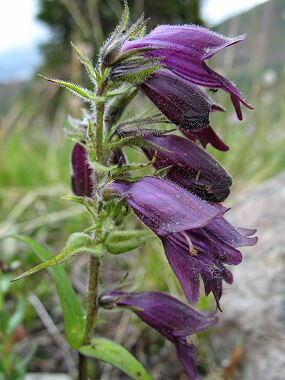 The plant grows in moist meadows and along rocky slopes at elevations between 6500-12000 feet. Whipples Penstemon gets its name from the fact that the leaves emit a strong odor when crushed. Whipples Penstemon blooms between July and August and produces lavender to deep purple flowers with 2 upper flaring lips and 3 lower ones which grow to 1 inch in length in downward facing clusters along the stem.